Following on my post about Leah Buechley’s intriguing TED Talk regarding “sketching” electronics, I would like to highlight the work of one of Buechley’s PhD students, Jie Qi. 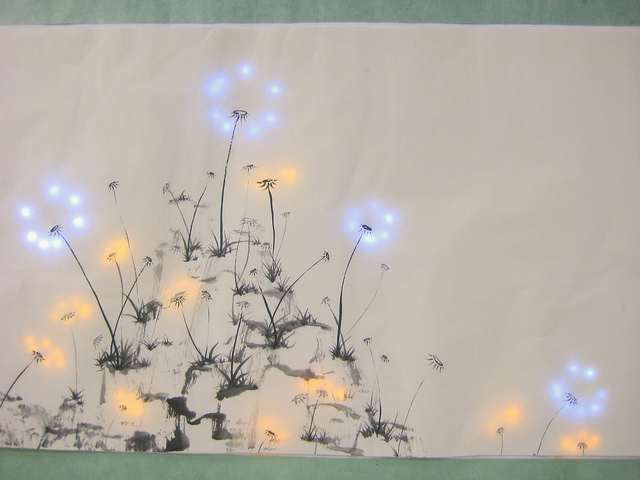 Jie has created several beautiful exploratory artworks that consider how to bond electronics to paper- or fiber-based substrates, such as the “Dandelion” painting shown above and in her Flickr gallery. Although the art itself is beautiful, I see this line of exploration providing the lighting industry a path forward from it’s long-standing roots in either the gaslight/plumbing paradigms of the 19th century or the more recent consumer electronics paradigms adopted with the switch to LED lighting. As LEDs reach record-highs in efficacy, the thermal issue goes away. This will allow LEDs to be bonded directly to natural, biodegradable materials such as paper, fibers, and wood products. It was this very topic that I covered in my recent DOE SSL Manufacturing Conference presentation, Advanced Materials and Methods for SSL Luminaires (the slides of which are available here).